The North American F-86 was designed to meet a late WWII requirement for a jet powered Pursuit aircraft and was a development of the companies Fury naval fighter. During its design captured German research work convinced the designers to sweep the wings. The resulting aircraft became one of the benchmarks of early jets. Whilst the hardware was ground breaking it was the air-to-air clashes over Korea that made the legend that is the Sabre. Here the Cold War turned hot and well trained, mostly, American pilots took on a superior numbered enemy and gained the advantage. 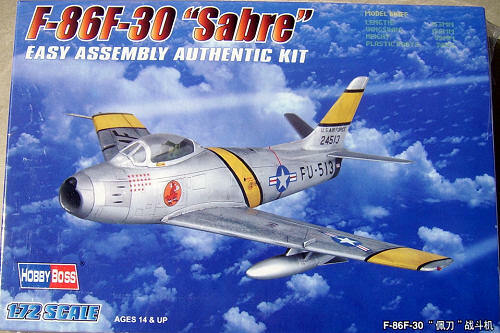 The F-86F-30 introduced a more powerful engine and modified wing. The latter was extended in cord 6in at the wing root and 3in at the tip to give the Sabre better turn at high altitude and this removed one of the advantages it’s sparring partner, the Soviet Mig 15, enjoyed. As with all the kits in this series by China’s Hobby Boss, on lifting the lid of the box you are confronted with what resembles a cross between a high-end resin kit, or one of those diecast models that require some assembly or a partially assembled injection kit. That impression comes via the moulding of the majority of the fuselage as one piece and the wings and the underside of the fuselage as one unit. These and the remaining parts are packaged in a vac formed tray, which very effectively prohibits parts moving around and getting broken. 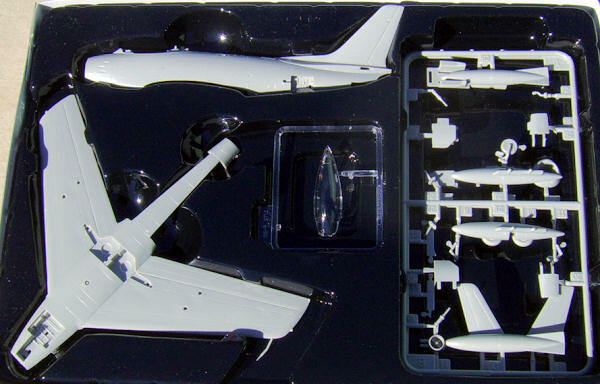 This kit consists of 31 parts moulded in grey plastic. Detailing is of the engraved type with panel lines and some rivet detail. Wheel wells and speed brake interiors have detail and are reasonably deep, the front well however appears a little too wide. The cockpit is reduced to a tub, which also has the upper half of the intake moulded to its bottom, side consoles have no detail and no decals are provide either. Added to this are a stick and seat, the instrument panel is moulded with the fuselage, again with no detail or decal. Some gun sight detailing is also provided, as is some for the area under the canopy behind the seat. The single piece canopy is very clear but it has a couple of large mounting tabs that will probably be seen from the outside once it is attached. 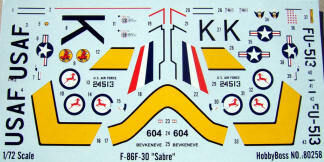 Being boxed as an F-30 the wing is of the correct type and has the small fence. Panel lines on wings and fuselage appear to be correct but undoubtedly the micrometer crowd will say different. There is a seam that runs the length of the upper fuselage that will need sanding down. The parts for the undercarriage are reasonably detailed, however there are moulding pips and seams to remove. The front wheel is formed with the leg and the main wheels are simplified. Door inner faces also are detailed but ejection pin marks are present on the main doors. A strange thing with these doors is that one has a single mounting tab and the other has two, this is probably to ensure no mixup in construction. This will add some work to cover these up. Larger than necessary attachment points are used for the U/C and other assemblies but these are part of the simplification of these kits, in some ways they are part push together, so be prepared for a struggle to separate parts if you dry fit them. Underwing items are just a pair of drop tanks, their sway braces have large attachment points to the tanks and these are areas that will need filling. Aircraft of Maj. James Jabara, 334th FS, Korea, July 1953. This aircraft is overall silver with yellow UN id bands. Aircraft from 2 Sqn. South African Air Force, Korea named Bevkeneve. This aircraft is also in silver with the yellow id bands. The instruction sheet is a folded A4 size with a diagram of the sprues, 2-step construction diagram and painting and decaling guide. The latter is in colour and will need close study. Overall this simple kit looks to have much promise. Why Hobby Boss did not include decals for the cockpit is a mystery and this is one area that can easily be improved by their addition. Price wise it hits the shelves as the cheapest genuine scale model in this scale and is remarkably good value.